Where can I find the Foreign Students’ Secretariat? What are the Foreign Students’ Secretariat’s office hours? How do I get my class schedule for the next term? You can check your schedule in your Neptun under Studies/Class schedule after subject registration. How many credits do I have to earn per semester? Please see your semester curriculum in the Calendar. The amount of the required credits are set out by each semester’s curriculum under the curriculum schedule. 1. The credit value of subjects accomplished in other institutions of higher education and recognized by the University in a credit transfer procedure shall not exceed two-thirds of the credits required for the award of the diploma as defined by the qualification requirements. How can I apply for the approval of the place of the summer practice? No approval or certificate on completition is needed in this case. The completition is recorded in the Neptun system by the host Institution/Clinic. To organize your practice and ensure that you will be accepted you should contact the relevant Institution/Clininc and speak with your tutor. Please note: some Semmelweis departments require that you do a special registration via Neptun for their summer practice. About details and departmental regulations, please consult your tutor. Approval of such summer practice is needed beforehand, and a certificate on completition must be submitted at registration to the next term. Please contact your registrar for details with specifices. When and how do I have to submit the certification on my completed summer practice? Certificates on a complteted summer practice outside Semmelweis University should be submitted to the English Secretariat at the registration to the next term. Please note: students are not allowed to proceed to the next year unless the form of completion is submitted to the English Secretariat at registration. Please use the downloadable forms at each Faculty. How much is the tuition fee per semester? The tuition fee is determined by the year of enrollment to the Program. Students who complete their studies continually (without failing a year) pay the same tuition fee every year (see the table below). Students who repeat a year due to failure or a passive semester, and students transferred from another university have to pay the tuition fee according to the year of enrollment at the course they are joining. Eg. a student enrolled in 2015/2016 academic year and failed a semester has to pay the tuition fee of those enrolled in 2016/2017. Students taking just one normal, exempted “FM” or one exam course “CV” in a semester pay ~50% of their semester tuition fee. Please note: The permission can be granted upon the student’s written request that has to be handed in at the English Secretariat before starting the semester! When is my tuition fee due? The current deadlines of payment are announced by the registrars before the beginning of every semester. Rules regarding tuition fee payment and penalty. After the semester’s first month has passed, the tuition fee can be paid with a default penalty of 500 USD. If the above final deadline is missed, i.e. the tuition fee plus penalty are not settled by the end of the study period, the tuition fee for the current semester can no longer be paid, student’s status will remain active, but every signature acquired and every grade earned by the student during the semester will be deleted. Please take the above rules and deadlines seriously as they will be strictly enforced. What is my tuition per semester? All continuing students will remain on the same fee rate as when they first enrolled in the program. Students who take a semester off, failed a year, or transferred from another university has to pay the tuition fee of that specific year they join the program (again). How can I ensure full payment of the tuition fee on time by bank transfer? To ensure full payment, please consider that a transfer fee is usually applied when sending money by bank transfer. When transferring the exact amount for the tuition fee, a transfer fee might be deducted from that amount, rendering your tuition fee deficient. Therefore, please contact your home bank prior to transferring the tuition fee and find out whether the bank deducts a transfer fee from the transferred amount. If yes, please pay the transfer fee in addition to the tuition fee. all payments can be made by wire transfer to Semmelweis University’s below bank account. Payments have to be made in USD. It is your responsibility to ensure timely and full payment of your tuition fee. It is important for you to keep in mind that checking whether the tuition fee has been paid properly is your responsibility. You are recommended to contact your registrar each term before the payment deadline to find out whether the tuition fee has arrived without any problem. Am I eligible for a reduction of the tuition fee? Students may apply for a reduction if they completed all the obligatory subjects and gained at least 20 credits in the semester, and their weighted average is 4,51 or above continiously started from the first or the second semester of the first year. If the weighted average is 4,51 or above in the first semester a reduction can be granted in the second semester. If the weighted average is 4,51 or above only from the second semester then the reduction can be granted from the third semester. The reduction is 10% for students having a weighted average between 4,51 and 4,99, and it is 15% for students having a weighted average 5,00. Students who have a weighted average below 4,51 during their studies after the first year are no longer eligible for a reduction of the tuition fee. No reduction is given in case of exemption from one or more subjects. Students working as teaching assistants (TA-s) may apply for a reduction – 300 USD per semester in their tuition fee for the semester that follows the teaching assistance course. Your weighted average from the previous school year (indicated as ’Average’ in your Neptun account and ’Weighted average’ on your transcript. See definition at FAQ-s.) must be at least 3,51. You must have received either an ’Excellent’ (5) or ’Good’ (4) as the final result for the subject relating to the TA course you take. If the completion of the course has been officially considered and accepted by the English Secretariat and the student has met the above requirements, then they may be given the reduction in the next semester’s tuition fee (they can pay 300 USD less.) Tuition fee reduction is not automatic! Taking the TA course does not negate the student’s responsibility to make the scheduled tuition fee payment in full by the appropriate deadline. Students are only entitled to receive their refund after they have been officially notified in writing by the English Secretariat. 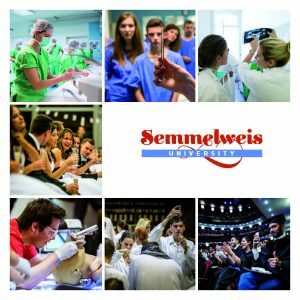 In case the student completes more than the compulsory 3 weeks of clinical rotations at Semmelweis University, he/she has to pay 100% of the tuition fee valid in that academic year. In case the student completes the 2 weeks compulsory Pediatrics rotation and 1 week Transfusion course at Semmelweis University and completes the remaining of the rotations abroad, he/she has to pay 80% of the tuition fee valid in the academic year. The relevant acceptance letters should be handed in latest until December 15. Otherwise the student is not entitled for the reduction! Please write a letter of request addressed to the Academic Program Director when applying for the 20% reduction! Application should be submitted during the registration week. Further information will be announced by the registrars. Study average means the weighted average, which is a way to measure a student’s academic success in school. The weighted average is calculated from the grades and the credit points belonging to each subject. For each completed course for the previous semester, the number of credit points must be multiplied with the grade received. All subjects are added up and then this amount is divided by the total number of credits collected in the semester. What is the difference between weighted average and cumulative weighted average? The weighted average and cumulative weighted average are based on grades given for each course taken and the number of credit hours specified for those courses over the specified period of time (one term for weighted average; more or all terms for cumulative weighted average). The difference between the two is that weighted average is calculated for one semester of the year and cumulative weighted average is based on two or more semesters of the individual. What if I can’t attend an exam or class at the time scheduled? Students are required by university regulations to present written justification stating the reasons of their absence. Upon returning to school after an absence, students should report to the department’s office and present a doctor’s note, if their absence was caused by medical reasons. Excuses not provided within 3 days after the missed exam or class will result in the absence being marked as an unexcused absence. It should be noted that the student will be recorded absent even if s/he is absent for a valid reason such as sickness. In the case of absence with a valid reason, an official document that proves the reason of absence should be provided. The department has the right to reject any document of questionable credibility. If you are sick and cannot take the exam or class, you should telephone your tutor immediately and leave a message for the department office even if this is not the first day of your absence. Do I have to pay a fine if in case of my absence from an exam remains uncertified? How do I pay my missed exam fees online? If you choose to pay by check please visit the Foreign Students’ Secretariat to collect your check. The check must be paid at the post office. Do I have to pay for exams? How do I order a check for my 3rd or 4th exam in a given subject? First, please read the section titled “Extra curricular fees” in the Calendar, where you’ll find the different extracurricular fees. Log on to your Neptun account, go to „Finances”, choose „Payment”, then „Transcribe item”. Choose „Retake exam”, choose „Semester” then the relevant subject from the list and finally click on „Create item”. You can choose to pay your retake exam fees online via the Neptun system or by check. To pay online you will have to select ’Payment by credit card’ from the two payment options offered to you. If you choose to pay by check please visit the Foreign Students’ Secretariat to collect your check. The check must be paid at the post office, the check stub is to be presented on site prior to the exam. Should I go directly to the department when applying for an exemption? Yes, except in case of Physical Education, summer practices and First Aid. Physical education medical certificates and certificates/degree proving the completion of summer practices/first aid course must be submitted to the Foreign Students’ Secretariat by registration to both semesters each year. For a physical education exemption you must also submit a letter of request describing your problem in a few words and apply for a permission to be exempted from the subject. The request letter must be addressed to the Foreign Students’ Secretariat. For other subjects you must first get a blank exemption form from the Foreign Students’ Secretariat. Then, you must show the form and certificate of your previous studies to the competent department, which will be reviewed before granting an exemption from the subject. You need to get your exemption form signed and stamped at the department. Important: the teacher must indicate the grade for the subject on the form. After having the form completed and stamped, you have to return it to the Foreign Students’ Secretariat for processing. If everything is OK with the form, your registrar will enter the given grade into the Neptun system and indicate it in your grade book. If you successfully complete the above, you have no further obligations regarding that particular subject. Approved exemptions must be submitted to the Foreign Students’ Secretariat by the start of the semester! Can I be exempt from Physical Education if I have a gym membership? No. You will not be exempt because of your gym membership so please do not apply for an exemption on these grounds. What is the process of submitting a doctor’s note for Physical Education exemption? If you are requesting an exemption from physical education due to medical complications that inhibit you from partaking in physical activity for an indefinite time; you then must submit evidence to the Foreign Students’ Secretariat in Hungarian or in English language from a licensed health care practitioner that documents a diagnosis of a temporary physical or mental disability. What do the so-called CV and FM exams mean? CV and FM are abbreviations. CV stands for the Hungarian term „Csak Vizsga”, meaning „Exam only”. The term indicates that the student has already received the signature for taking the course, that is, fulfilled the semester requirements and only the exam is missing, which can be taken in the following semester. Do I have to fail a course at least once in order to be allowed to take the CV course in the next term? No. You can roll over all 3 exam opportunities to the following semester and take them as a CV course. How many retake opportunities do I have in a semester and in an academic year? There are 3 exam opportunities in each subject per semester (1 exam, and 2 retakes) when the subject is offered as a normal or FM course. In the following semester – when the subject is offered as a CV course – only the remaining chances left from the previous semester can be used. There is a special 4th try once a year (the 3rd retake), which may be used exclusively in 1 chosen subject. After using this 4th exam opportunity in one subject, the student shall not have a 4th try in any other subjects; they also will not be granted “special permission” for a 5th opportunity. Please count your remaining exam opportunities carefully! For example, if you use 2 exam opportunities for Biophysics II in the 2nd semester, you will have only one remaining opportunity for the retake in the following semester (plus the one extra (4th) chance, if you haven’t used it already in that specific academic year in another subject). Prerequisites are courses that must be taken before another course. For example, Medical Chemistry is a prerequisite for Medical Biochemistry, Molecular and Cell Biology I. Students must successfully complete Medical Chemistry before registering for Medical Biochemistry, Molecular and Cell Biology I. Please note that prerequisites are clearly listed in the curriculum. What do I need to do if I am planning to take a leave of absence? If you take a semester off you will need to email your registrar and register for a ’passive’ semester via the Neptun system during the registration period for the next semester. What do I need to do if I am returning from a leave of absence? Contact your registrar for procedures regarding returning from an official leave of absence and check your Neptun account on a regular basis. Make sure your tuition fee is paid by the relevant deadline. What is a transcript? How do I request my transcript? The transcript is an official statement of all results achieved through study at Semmelweis University as of the date of printing. You cannot have a transcript until all grades are posted in the Neptun student information system by the departments and your grade book is submitted to the Foreign Students’ Secretariat with all results. It is the department’s responsibility to upload the exam results to the Neptun system. Transcript requests must be made in writing. To make your request, you may stop by the Foreign Students’ Secretariat or send it via e-mail. You can indicate in your request if you would like us to forward the transcript to your email address. Processing of transcript requests takes approximately 5 business days. However, during certain times of the year there will be a slight delay, 2-3 days, due to the heavy volume of requests. The fee for the transcript must be paid for prior to the issuance of the transcript(s). Please be sure to allow sufficient processing time for your request. Please note: the university may discontinue or suspend this service at any time without notice if the fee for the transcript is not paid.